Talib hasn’t played since Los Angeles’ third game on Sept. 23. He is eligible to return when the Rams visit Detroit on Sunday, but coach Sean McVay said the team won’t decide until Talib goes through the week of practice. “Hopefully I look good enough so the coaches say I can play on Sunday,” Talib said. 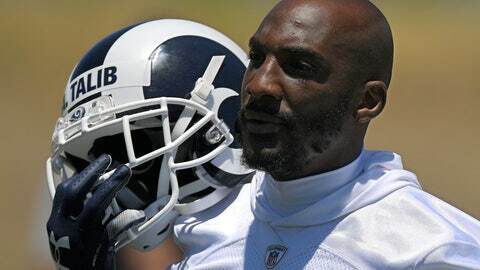 Talib is eager to resume his first year with the Rams, who acquired him from Denver last March to play alongside Marcus Peters in a revamped secondary. Instead, Talib got hurt in Los Angeles’ third game and needed surgery on his ankle. Three of the Rams’ final five games are on the road as they chase New Orleans (10-1) for the top seed in the NFC. Los Angeles is one win or one Seattle loss away from clinching back-to-back NFC West titles for the first time since 1978-79, but its bigger race with the Saints could go down to the final week of December. Talib has stayed active in meeting rooms and on road trips during his injury, maintaining his leadership role even while he can’t play. After a tumultuous career marked by missteps including everything from fistfights and chain-snatching to self-inflicted gunshot wounds and non-prescription Adderall, Talib has been a steady voice of veteran inspiration for the Rams. Troy Hill has started seven games at cornerback opposite Peters during Talib’s absence, and Sam Shields has played extensively. Both cornerbacks are likely to stay in important roles alongside nickel back Nickell Robey-Coleman, but Talib’s shutdown skills are much-needed on a defense that gave up 346 yards passing to Drew Brees in LA’s only loss and 478 yards to Patrick Mahomes in last week’s big win.